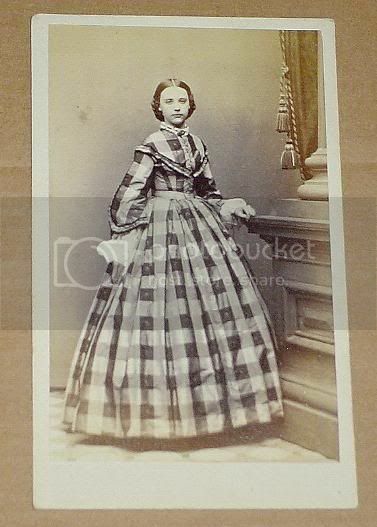 This dress really began long before I ever even considered making any 1860s clothing at all. Mike and I were at Hobby Lobby and saw this plaid silk on clearance. He commented that it would make a great Civil War outfit; I resisted for a while, and then went back later and bought it after all. Seven dollars a yard, people. I wound up with eleven yards and no plans at all. That roll of silk traveled with me through two moves across Grand Rapids, patiently waiting for my attention. The skirt was the first piece I made; it's just three panels of the silk's full width, knife pleated to a waistband. 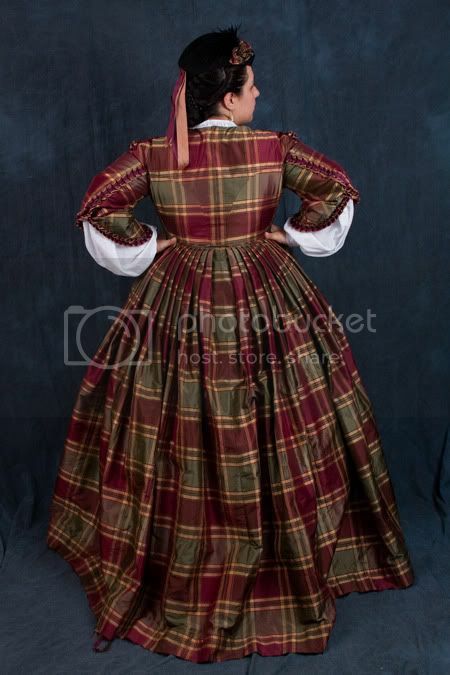 Because of the way skirts in the period were balanced, the plaid is level at the botom of the skirt and the length is adjusted at the waist, which makes for a beautiful contoured effect in the way the skirt falls towards the back. I based the shape of the skirt (with a train) off an example from 1865 from Costume in Detail, which seemed appropriate for a silk dress. Obviously it wouldn't be going on any camping-type reenactments anyway, so the length could be slightly-less-than-perfectly practical. It did turn out a little on the long side, though, so eventually the whole thing will be shortened probably half an inch all the way around and the hem (which is currently faced with a strip of brown linen) will be bound with a tape to protect it. Image from The Graceful Lady. This portrait was my inspiration for the bodice. 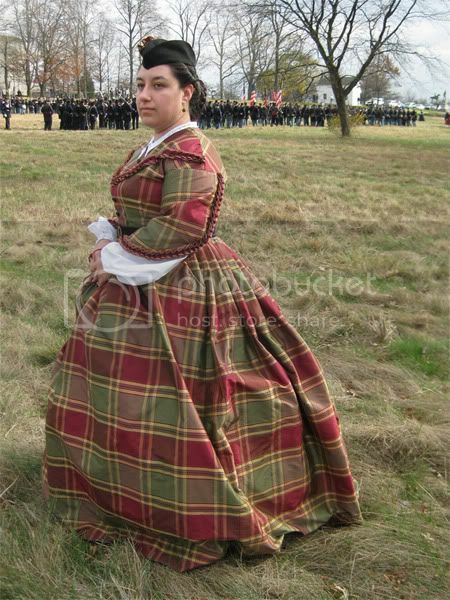 I started out by looking for plaids similar to mine, fairly square, just to see how they were treated. 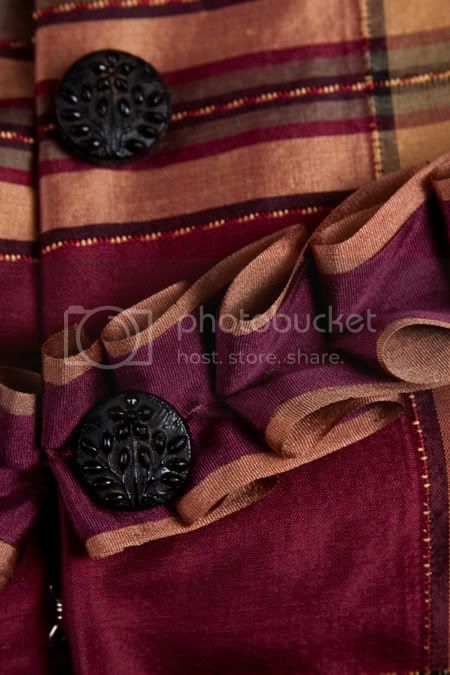 The sleeves on this really fascinated me, being sort-of pagoda, sort-of not. I also really liked the trim. The diagonal lines across the chest set it slightly later, since early in the decade tended to be more horizontal. My guess for this particular picture was probably '64 or '65. Highly technical, I know. The collar and undersleeves are of cotton organdy, and the collar is edged with a bit of needlerun lace I picked up on a whim at Field's. 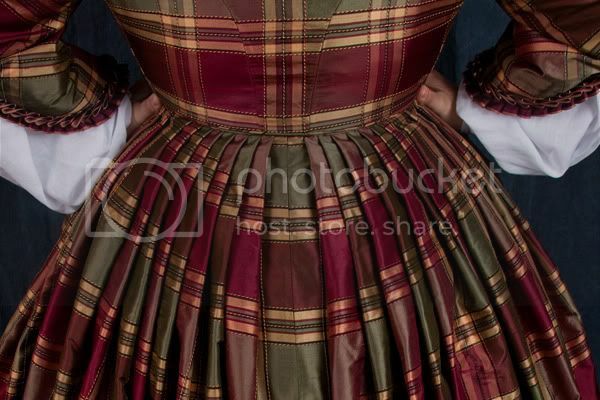 The bodice trim is two different silk ribbons, pleated together and stitched by hand to the bodice on one really, really long car ride from Grand Rapids to Menominee for a wedding. 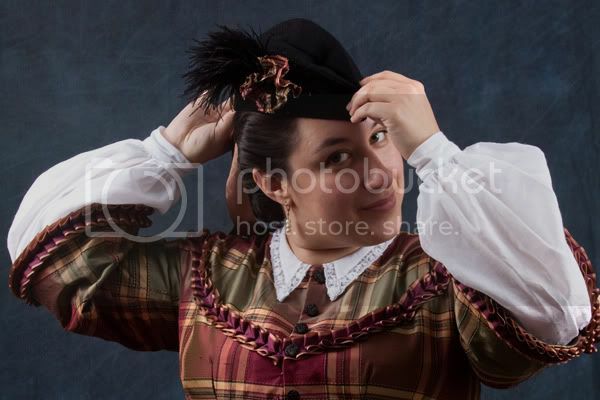 The hat was a last-minute project, completed start-to-finish the night before we left for Gettysburg. I started with the garrison cap pattern found here, and, uh...pretty much guessed at it, since I couldn't get the .pdf to print at anything approaching normal size. I made it up in black wool, lined with black silk taffeta. It's trimmed with a little cockade of the plaid silk, one of the same buttons from the bodice, and a little plume of ostrich feathers that I bought while in Gettysburg. Oh, and little streamers off the back of the same ribbon used on the bodice. Studio photos courtesy of Michael Caterina.